Happy Father's Day all the dads out there! Does anyone have any special plans for the day? Whatever you do, I hope you have a pleasant day. The current heatwave was enough to convince the city to turn out the local parks' water pads, including the one at the local park where we like to hang out. One hundred ten degrees is worthy. City officials aren't sure whether they will leave it on the entire summer, or set a limit for days only over 95. If the summer goes as it usually does, that will be every day. Anyway, to beat the summer heat this weekend, we decided to get out of town--at least for Saturday. We had a fun-filled day and came home exhausted. We may make our way over to our local park on Sunday for some water play, but more than likely we'll be sleeping in (to recover from Saturday), staying cool indoors, and taking it easy before the work week starts up again on Monday. How are you spending your Sunday? Did you have a good week? I do as a matter of fact. It is a photo of me with Gracie on my head. I had just gotten my hair done that day at a salon and went rather crazy trying to groom and eat my hair. It was a fun moment. Past profile photos have not included me at all, but rather been photos of cats reading in one form or another. I very rarely post photos of myself--more for professional reasons than anything else. My Facebook profile picture is of me (and my daughter), but more than likely, my blog profile will never be a photo of me. What about you? Do you use a photo of yourself for your profile picture? What I Am Reading: At the moment I am reading my first nonfiction book of the year. Grace Without God: The Search for Meaning, Purpose, and Belonging in a Secular Age by Katherine Ozkment was a surprising choice even to me but it was like kismet when I came across the title. You will understand when and if you read my review. As soon as I wrap this one up, I will be reading my June TBR List Winner, The Magician's Lie by Greer Macallister. I am really excited about finally reading it. What I Am Watching: I have finally gotten back to Jessica Jones and finished out the first season. A Daredevil character (my favorite one, in fact) finally made an appearance. I always get a little thrill when characters crossover from one show or another. I'm not sure why exactly. 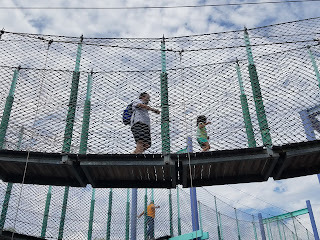 COYER Summer Vacation began this weekend, and I am jumping on board again. It's really just one big reading party. There are games (including some on Facebook) and Twitter chats, book reviews, and lots and lots of reading. Although COYER stands for Clean Out Your E-Reads, the rules are being thrown out the window for the summer--at least mostly. Participants can read whatever they want whether it be e-books, physical books, or audiobooks. Doesn't matter if you buy, borrow or read an ARC. All books count. I can set my own goal--or no goal at all. COYER Summer Vacation will last from June 18th to September 5th. Are you joining in the summer fun? 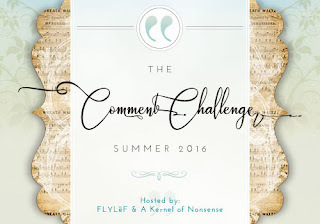 I thought it would be fun to take part in the Summer 2016 Comment Challenge (Link Up Post) hosted by Lonna of FLYLēF and Alicia of A Kernel of Nonsense during the month of July. While it officially began in June, sign-ups are monthly through the summer. I first heard about it through Melinda of West Metro Mommy Reads and thought it sounded like fun. 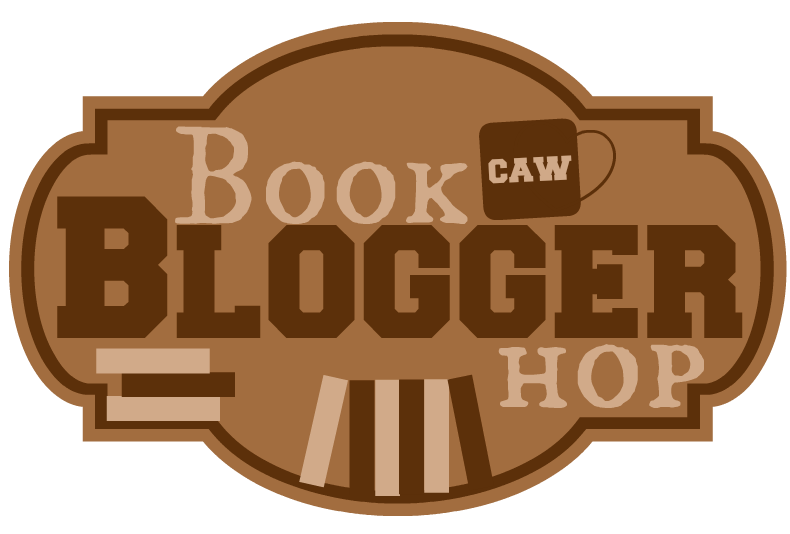 Each participant is paired with another book blogger. The pair then post comments on each other's blogs throughout the month. We all like receiving comments, which is a a definite perk, but the biggest reward will be in making a connection with another book blogger. It's a great way to get to know another blogger and possibly make a new friend. I hope you will consider joining too. There isn't much time left to sign up for July (by June 21st!) --so hurry! It'll come around again in August though, if you miss the deadline. While on Twitter the other evening, I saw mention of a read-along for Joe Hill's The Fireman, which I just so happen to have a copy of and want to read. Now is as good a time as any! The read-along takes place this July, and is being lead by Fire Squad Captain Care and her Co-Commander Heather. Melissa, Jen, and Melissa, Ti are the Platoon Leaders. Michelle and Katie are Advisors (because they've already read the book). To follow the read-along on Twitter, just follow the hashtag #FireManAlong. Because goodness knows in this summer heat, I'm sure many of us will feel like we will spontaneous combust. Will you be joining along? I went into the the 10th annual Once Upon a Time Challenge hosted by Carl of Stainless Steel Droppings with the goal to read one Fantasy novel, and I am happy to say I ended up reading six. From Young Adult High Fantasy to quite a variety of Urban Fantasy, each book brought something different to the table, exploring mythology, a bit of fairytale, folklore and fantasy. I enjoyed each of the books I read for this challenge, but my favorite is Neverwhere by Neil Gaiman. Did you take part in the challenge? What is your favorite fantasy novel? WE INTERRUPT REGULARLY SCHEDULED POSTING FOR THE BURDEN ON MY HEART -Andi from Estella's Revenge opens up about how recent events are impacting her. I can relate to how she feels. I have no words. I can offer up prayers and thoughts but that really only goes so far. 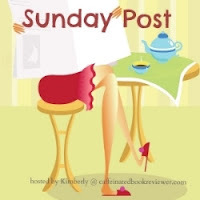 Help Needed: Wednesday's Favorites - Maureen of Maureen's Books has a great feature every Wednesday in which she talks about old favorites. She's posted a poll in hopes of getting some feedback. I hope you will take a look! PERIOD PIECE: A PUNCTUATION POST - Chris from Bookarama talks about the current trend of leaving out periods in text messages. I guess it's out of style to text in full sentences with proper grammar, like I do. What's Going On Off the Blog: It was an ordinary week. One exciting thing happened: I was complaining the other day about not having enough rags, and this week I'm finding just about all my socks have holes. Wishes really do come true. The summer swim session for Mouse has started. Oh, why did I pick an afternoon time for the lesson?! What was I thinking? Oh, that's right. I wasn't. My mother-in-law's angiogram came back clear, which is good. She meets with the cardiologist this coming week. We're all hoping the news will be good. We are all still in shock that she had a heart attack without anyone knowing . . . It's a reminder of how important it is to know the signs and take them seriously--not assume they might be something less without first getting it checked out. One of my favorite photos from three years ago. Lonna - Thank you! I think the Summer Comment Challenge is such a great idea on several levels. I look forward to being a part of it this next month! Thank you to you and Alicia for hosting. I look forward to seeing who I am paired with (and am a little nervous!). Looks like a fun outing, glad you guys got to beat the heat a bit! Yeah I would say 110 qualifies- wow that's crazy. Way too hot! How did you like Jessica Jones? Glad you're doing COYER, and glad your mom got good news on her angio. Best of luck going forward! Greg - It was nice. We even got a little rain which we hadn't expected. I have a feeling we'll be spending most of tomorrow indoors--except for my Father's Day morning doughnut run. I nearly didn't sign up for COYER, but I'll still be participating in the Facebook games, so I figured I might as well. :-) It'll be fun. Thank you for the well wishes for my mother-in-law. She's suffering through hot temps where she lives too and desperately wants to get in her pool. Unfortunately, the doctor is saying no for the time being. Wishes really do come true! What a hilarious take on holey socks! I may have to check out this comment challenge thing. Wendy - Haha! Yes, they do. :-) I hope you will take part in the Comment Challenge. It looks like it will be fun. Thanks for visiting, Wendy! I've heard great things about The Fireman. I'm still not sure it'd be *my* kind of book, but it does sound unique. I'm cracking up at your comment about how wishes really do come true lol. I'm glad your mother-in-law's test came back clear :-) Have a great week! I'm not sure The Fireman is for me either, to be honest, but I enjoy Joe Hill's writing so I thought I would give it a try. I hope you have a great week too! Thanks for stopping in. Glad you had a nice outing Saturday. I really like Jessica Jones I hope they do another season. Have a great week! Shandy Jo - It was nice to get out of town for the day. We had a fun time. :-) I would like to see another season of Jessica Jones too. They definitely left the door open to do so. I hope you have a great week too. Thanks for visiting! That kind of heat (especially this early) is just awful. Hope you and your family are having a perfect Father's Day, Wendy! Jenclair - It is way too early for these high temps. It's 111F out right now. Ugh. We ended up going to see a movie at the mall this morning and Mouse got to play in the mall's play area after. It was a nice way to stay out of the heat. Now we're letting Dad nap. :-) Thanks for visiting, Jenclair! Hope you get some relief from the weather! It's been hot here too but not that hot. I actually prefer hot days to very cold weather. I may have to participate in COYER and the comment challenge. I'd heard of COYER before and this version of it sounds very doable though I do prefer to read on my Kindle anyway. Christina - Let's just hope the air conditioner continues to work, and I'll be okay. :-) I'm with you--I prefer hot to freezing too. COYER is very laid back. I hope you do decide to take part in both the Comment Challenge and COYER! I really liked Jessica Jones but don't usually watch those kinds of series. I think I liked its darkness and she's great. Hope you were able to stay out of the heat today and get a sleep in! Deborah - Jessica Jones is one of the better shows of it's type I've seen. I am glad to hear you enjoyed it too. We're doing our best to stay indoors today. I shouldn't have told me daughter we were stepping into an oven when we left the mall this afternoon to head home. She started complaining immediately that her skin was burning. She's so silly. I hope you have a great week! Thanks for visiting. Father's Day will be me cooking all day for the family to come over. It's easier that way with my dad and husbands dad. Fingers crossed your Mother-in-laws test come back good! YAY, For COYER! you have a great goal, good luck! I really need to get moving on the reading but I don't be able to really start until Monday after the crazy of today. I hope you have a great week, Wendy! Happy Reading! Michelle - My poor husband married a woman who doesn't cook. I'm sure on days like today, he regrets that. LOL I hope you had a nice Father's Day. I'm sure your husband, dad and husband's dad had a good one! Thank you! We're all anxious to hear what the cardiologist has to say. Good, no, very good to hear about your mother-in-law's angiogram. Hope she continues to progress with her health...Water pads? I had to look that up because I never heard of them. My sister just put up a post on her blog about her children playing in a local creek and that's what I remember. I don't remember water pads. :) But it's good that the city provides for them. So where do you end up going yesterday? I saw out of town, but where? Guessing it was fun. Today for me? Staying in, reading blogs, reading books (maybe), and just generally chilling after a long week. Bryan - Thank you. We were all glad to hear the test came back clear. I know she's anxious to get the all clear from the doctor so that she can start her work outs again--they've helped her so much with the MS symptoms. Well, as much as they can anyway. I hadn't actually known what a water pad was until I saw mention of the term on the city's park's website. I wasn't sure what to call it before--so I'm glad to have a name for it now. We ended up not going today, choosing instead to hang out at the mall. We took in a movie and my daughter played in the indoor play area for awhile. A lot of others had the same idea. We spent the day in San Diego yesterday. The weather was a lot cooler--much more comfortable--and we even got a little rain. We had a nice time. I wish we could have stayed over until today at least, but it wasn't an option this time around. I never think of California as three-digit-hot. Let's hope things cool down your way. Deb - It's no unusual for my part of California to have triple digit temperatures during the summer, although the 111 we reached today is unusual. I'm hoping things will cool down from here on out too! Thanks for visiting and have a great day! I love that picture of Mouse and her husband. I have a very similar one of The Tornado and J and it's one of my favorites. I need to frame it and put it some where because it really is so sweet. I love the sound of those water pads. It sounds like a nice way to get outside and get some energy out without getting sooo hot. Have a great week! Katherine - I keep meaning to print and frame that photo. I just love it. :-) The water pads are so nice for the warmer days and for kids who don't have pools. We decided against going today--it was just too hot. I'm sure we'll take advantage of it at some point this summer though. If the city keeps them running, that is. I hope you have a great week too! Thanks for visiting! Sarah - Thank you! 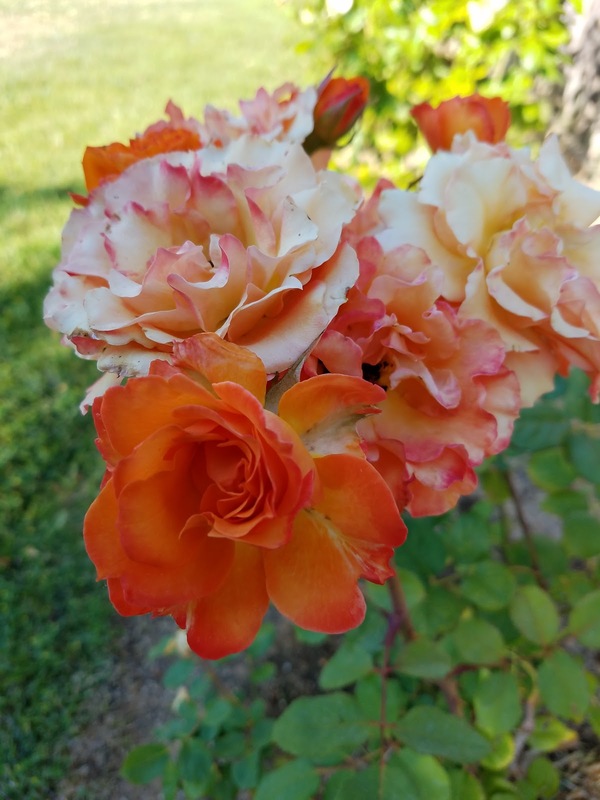 I'm always so surprised when I find such pretty roses on my bushes. They grow in spite of me. :-) The news about my mother-in-law's tests was such a relief. You have your hands full this summer, so I can imagine taking on a reading challenge too would be too much. I wish you the best with your editing and getting your trilogy published! I envy you your cool weather. Maybe I can share some of the heat I've been having with you. :-) Have a great week, Sarah! I don't have any idea how much I have read for the Once Upon a Time Challenge. lol I signed up, and have definitely read stuff, but I have not been paying attention... oops! Kelly - Haha! If it makes you feel better, I didn't link any of my reviews to the website. I kept forgetting. I love the beach, and the sight of it always makes me sigh with pleasure at those moments I remember. Laurel-Rain - That was a good beach visit. Our second one, not so much. LOL My daughter isn't a fan of the beach as much as she likes the idea of it. That's a wonderful photo of Mouse and her dad. Definitely one to treasure. I've always thought that your profile picture with your cat on your head is hilarious! I need to watch Jessica Jones one of these days. Maybe during the summer when my shows go on hiatus. Fingers crossed for your MIL! Heart attacks are always scary. Athira - Thank you! It's definitely one of my favorites. :-) I think the photo with Gracie on my head is funny too. She's such a silly cat. Thanks for the good wishes for my mother-in-law! I hope you have a great week! Elizabeth - Thanks! I hope you enjoy your week! Wow, what a busy week. We just hit 100s here for the first time this year and didn't turn on the swamp cooler early enough, so all my little fans are on too. Jeanene - It's too soon for 100+ weather! I hope you get relief soon. This is when I really wish I had a pool of my own . . .
Glad you are joining the Comment Challenge for July! I just started working on the pairings this weekend and I hope you enjoy commenting on the blog I've chosen for you. Have a lovely week! Alicia - I'm looking forward to seeing who you've picked for me! The challenge will be so much fun. Thank you for hosting it. :-) I hope you have a great week too. Thanks for sharing these photos-- I love flower shots and beach shots-- and Mouse is so small there! I actually have access to The Fireman-- my son has it-- but I'm not ready to read it yet, have to be in the right mood. Also, unfortunately I don't use twitter so I can't join that read-along group. Enjoy it when you do read it. I wasn't planning to read The Fireman quite yet, but the ladies on Twitter talked me into it. I am not the best with Twitter chats--I'm on so sporadically--but we'll see. I hope you are staying cool! Thanks for visiting, Rita! It's been blazing hot here too. Yesterday we went to a swim party, so it alleviated half of the day. Even our evening walks at 8 pm are getting bad - still 90 degrees. So thankful your MIL's test came back good. The man's dad found out a couple of weeks ago he had a stroke at some point and never knew it. It's hard to believe that can happen. I am so sorry to hear about your man's dad's stroke. Those are really scary too. I hope he is doing okay now. I hope you have a great week. Thank you for visiting, Charlie! I'm glad your MIL's test came out to be good and I hope the cardiologist appointment will be the same too. Love your roses. Hope you've a great week! This weather is horrible. Our university just asked us to turn off all non essential electronics because the grid can't handle the extra load. I cannot stand the heat but in the shade it's not too bad. I am glad you can join us for Fireman. It's one of those no pressure deals which works well for me. No structure just lots of fun chatting and support. Ti - I've been hearing the warnings about conserving electricity as much as possible. I suggested to my manager we turn out some of the lights, but that didn't go over well. The building next door lost its air conditioner and so the staff who couldn't tele-commute have been over here all day. It's finally cooling off. 109 to the 112 it was a couple hours ago. Crazy. I'm looking forward to reading The Fireman with you all! Take care, Ti. Stay cool! Sounds like it’s very very hot where you are. Maybe you can send some sun here? LOL!! Here it’s been raining for days now.. I can’t wait for the sun to get back. It’s so depressing looking at all that rain and all those clouds. Good to hear your mother in law’s angiogram came back clear. Maureen - I would be happy to send some of our sunshine to The Netherlands. :-) I hope you do get some sunshine soon. I hope your internet issues are all resolved. It was good to visit with you again. :-) I hope you have a great week too! That really is a very cute photo you have on your profile page. I have a photo of myself and my pup Mayci on my about me page. Thank you for stopping by my blog hop. Katiria - Thank you. :-) Those perfect photo op moments don't come around too often. LOL Thanks for visiting! I am glad to hear you are participating in #COYER as well. We can cheer each other on! Stay cool and have a great week! Samantha - Yes! I like that idea. :-) I hope you have a great week too! I'm glad I live somewhere a bit cooler than you do- I don't do well in heat. 90s in the shade I can handle, but otherwise I tend to bathe in my own sweat. 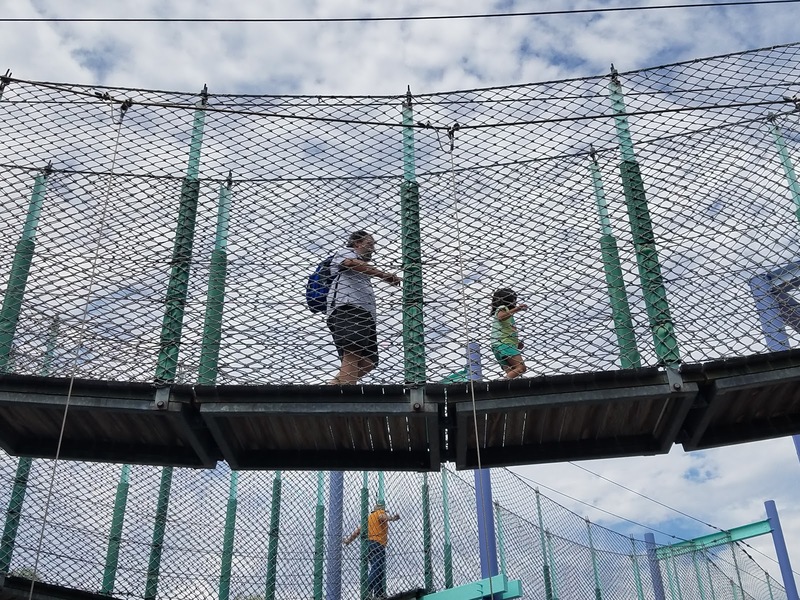 Your out of town adventures look fun- hopefully there was a breeze to catch there. I have my photo for my profile pic- there are times, though, I consider posting one of my brother and I instead. It's easier to avoid creepers/trolls that way. My FB photo is currently mostly George, so I guess I employ the exact opposite practice that you do. Good luck with your summer reading! That flashback photo is gorgeous. Litha Nelle - I do better in the heat than cold, but a milder climate would be nice. I think I would be much happier if I lived on the coast. It was actually very nice the day we were in San Diego. We even got a little rain. It was much more pleasant than if we'd stayed at home. I absolutely love the story behind your profile pic! My blog/goodreads/librarything/amazon profile pics aren't of me either, I tend to keep those of other things. My Twitter/Facebook and Instagram are of my face though. I find those social medias are more personal. I have more friends and family on there. Sweet photos, especially the beach one. I love taking those kinds of candid shots of my family as well. the reading/blog challenges look like fun, I have The Fireman on my wishlist. I do enjoy Joe Hill. I was upset Stephen King was in my area recently on a book tour but he was sold out! I shed a little tear over that one...lol. He was less than one hour drive away. Well, hope you are staying cool in the heatwave. It's gotten hot here too, but not heatwave weather yet. We have a pool so it's nice to be able to dip in and cool off but I am really looking forward to going away on vacation in a few weeks. We're back into triple digit heat today, although not as bad as last weekend. I will be right over to use your pool (just kidding, of course). Thanks for stopping by! First off, the blog pic. That's a really funny photo of you with the cat on your head! Lol. I'm a horse lover myself, but don't have one. If I did, though, I could have had a pic of my equine friend resting his chin (it would have to be a male horse, of course!) on top of my head. Sigh...just thinking of that makes me feel rather wistful.... I'm going to check out your FB page. That must be a very cute profile pic you have there! I'm so glad that your mother-in-law's angiogram came back clear!! That's WONDERFUL news!! I just hope she continues to be in good health!! Getting the good news sure helped you all enjoy Father's Day, I'm sure! Well, here I am, always complaining about the heat in Miami, and you guys have gone into triple digits!!! OMG!!! It's NEVER been that hot here. But heck, I start complaining as soon as it hits 80 outside. Lol. Hope you all stay COOOOL!!! Lol. I'm going to check out these challenges you've mentioned. They all look FANTASTIC!! And I hope you enjoy reading "The Magician's Lie"!! Maria - I don't mind the late comment. As you can see, my reply is late too. :-S Sometimes finding time to spend on the computer is just not easy to do, is it? At least not for long periods of time. I am sorry to hear you are dealing with personal issues, Maria. I hope things are better now. We had a nice Father's Day, and thank you. It was great news about my mother-in-law. I still haven't heard how her appointment with the cardiologist went. I need to ask my husband if he knows. They live far away from us, so we don't see them regularly. I hope you are enjoying your weeekend!